You are here: Home / Blog / Is reciprocal links better than one way link ? Is reciprocal links better than one way link ? Is reciprocal backlink good or bad ? Drafting my essay in guest posts style for a week. Phew! I finally manage to finish my “Top 10 lesson that I have learned from Marketing with Social Media” text book essay that is due before February 24 midnight.This post responsed to the lessons that I have read from the textbook – Marketing with Social Media, written by Prof. Bill Belew himself. Initially I drafted my original writing at my website and then copy and paste to BillBelew.com website as a guest writer this afternoon from my iPad while I was eating my late lunch in a McDonald restaurant (Thanks for free WiFi connection service). I also read the announment earky of the day where Prof. Belew talked about close loop issue in guest blog. This is something like whenever we create guest blog and posted as a guest post at a guest website, and having backlinks linking back to my Natural Health Products Reviews site. Conversely, I also need to write a post and have a link that links to the guest blog that I posted. This is what he called as “close the loop“. I don’t know in the eye of search engines i.e. Google, Bing, Yahoo, reciprocal backlink bring higher ranking, more powerful than one-way backlinks? To my knowledge reciprocal links (trading links) may have less value and might looks unnatural in search engines’s eye. However, search engine has more favor to one-way linking. Frankly speaking I don’t know it is true or not. I need an answer for that question. 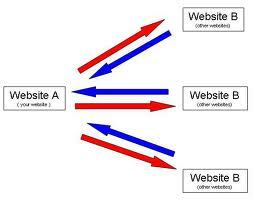 Or both linking strategy should include in our overall backlinks strategies. Do you have the same question in your mind? What do you think about the backlink issue, better titles for my blog posts. or anything? Share your experience with me. I would like to hear.